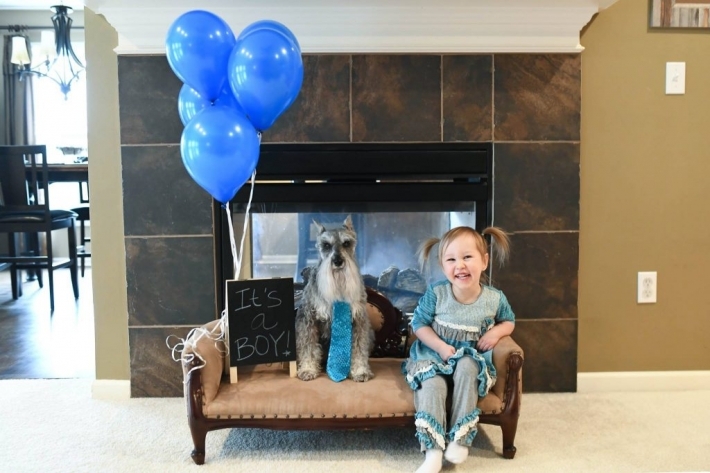 Gender Reveal – It’s a Boy! I am so thrilled to share with you the gender of baby #2! I was in for a HUGE surprise today when we found out the gender. Some people know I painted the nursery blue within a week of learning I was pregnant, bought boy themed clothes & décor and was totally convinced of the gender because of a vivid dream I had years ago. My grandma and I were very close. She passed away from breast cancer a year before I met Aaron. I visited her grave shortly after I met Aaron and asked her if she would send me dreams of my future. She was known to have visions and dreamt my gender and what I looked like before I was born and was 100% accurate. After visiting her grave, the next two nights I had two very vivid dreams. One was a dream of a large celebration/wedding reception with Aaron and our families. We were married 2 years later. The next day I had an even more distinct dream of a baby boy with a full head of black hair, blue eyes and he was wearing a bright orange plaid shirt and jeans. I was 100% convinced it was a boy based on every old wives tale and primarily because of this dream. Perhaps this dream was an indication of a future baby because we were told today they are 98% sure it’s a girl. So there you have it. I had a vivid dream showing me a baby boy with dark black hair and bright blue eyes. I was SO confused when we learned our first was a girl, but I realize now that this dream was a prediction of our future baby – the one who would complete our family. I am beyond thrilled that Abrielle will have a baby brother. Stay tuned for photos of this new journey!